Now you can get a free .in domain and website for your business that too absolutely free for a year. There are some new websites which are offering this facility which enables you to get a .in domain name and create a website free for a year. 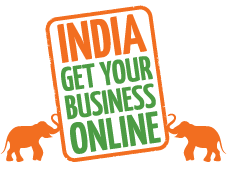 One such website is IndiaGetOnline which is providing a free .in domain name and a website that too free, this is only available to Indian users. The website has tie-ups with Google, Hostgator India,etc. Hostgator is one of the leading domain hosting service providers, very much famous for their affiliate program which many bloggers use to earn money. You can get yourself a website for your business by following some very simple steps. For someone who doesn't want to spend money on creating a website, this is the best opportunity for them to create a website on a custom .in domain without spending a penny on it. Once you create a website using their service you can keep it free for one year. After that if you like their service than you can renew the service and continue with the website. First of all you need to choose a domain name for your website which will be unique and cant be changed later. After you have chosen the domain name, you will be presented with a registration form which you need to fill up. You will need to enter PAN no. which will be used to confirm your nationality as Indian. In addition to the website and domain name, you will also get free email account with your website. After completing this step you will be taken to customize and publish step which will be the final step before your website goes live on the Internet. You can try it out and have your own website or blog without spending any money. I will suggest this to anyone who wants to start a blog on a custom domain and are not sure of spending money. If you liked the post or if it was helpful to you than do like the blog on Facebook and follow us on Twitter for any help regarding setting up your website or blog.